Space Launch Complex 2 (SLC-2) at Vandenberg Air Force Base (VAFB), Calif., is the home of west coast launch operations for the Delta 2 expendable launch vehicle. From SLC-2, satellite payloads are launched into polar and near-polar orbits. The base is on a western projection of California's central coast, midway between San Francisco and San Diego. SLC-2 overlooks the Pacific Ocean and is just northwest of the VAFB airfield. SLC-2 had its beginnings with the Thor intermediate-range ballistic missile, which was the predecessor of the Delta launch vehicle family. The complex, built in 1958, was part of a group of seven launch installations at VAFB designed for the Thor. The first Delta launch from VAFB occurred Oct. 2, 1966, with the launch of the Environmental Science Services Administration's ESSA 3 satellite for NASA. Others in the ESSA series followed, and during the same time period, Delta launched four NASA Explorer satellites designed for radio astronomy in deep space. Delta launched the Cosmic Observatory Background Observer (COBE) satellite from VAFB for NASA on Nov. 18, 1989, marking the last west coast Delta launch for more than half a decade. 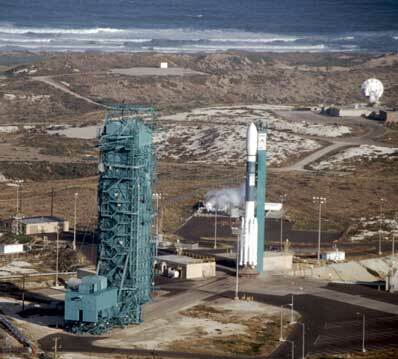 SLC-2 was refurbished in 1992 by raising the tower 12 feet to accommodate the larger Delta 2 model. Among the more recent upgrades to the complex is an automated Advanced Launch Control System (ALCS). ALCS provides greater availability of system status information to all operators through a commercial computer workstation on a high-speed fiber optic computer network. After a six-year hiatus, launch activities at SLC-2 resumed on Nov. 3, 1995 with a successful Delta 2 launch for NASA of the Canadian RADARSAT scientific Earth observation satellite. In addition to NASA and Department of Defense payloads, Delta has launched the majority of the Iridium global telecommunications network satellites, using 12 Delta 2 rockets. VAFB is the home of the Air Force's 30th Space Wing, the U.S. Space Command organization for all Department of Defense, NASA and private industry space and missile launch activities on the West Coast.